ALLEGRA BOVERMAN/Staff photo. Gloucester Daily Times. Gloucester: Stubby the cat is safe and sound in Harbor Loop. 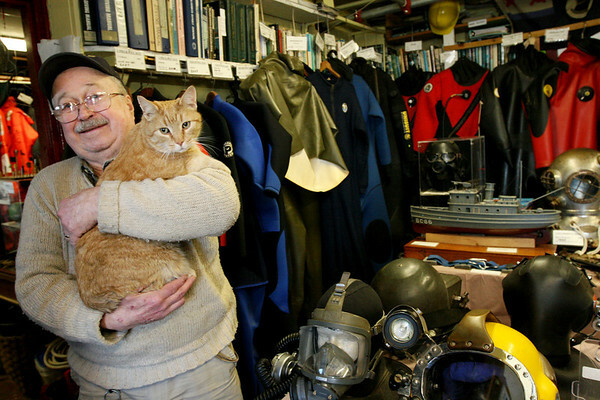 Paul Harling, of The Dive Locker of the Marine Maritime Center holds him on Thursday afternoon. Museum staff had taken him out of the rain the other day to see if he needs veterinary attention, causing consternation in the neighborhood about his wherabouts and possible disappearance, particularly with staff and customers at the TD Bank location there. Stubby has been a popular resident on Harbor Loop for 11 years.